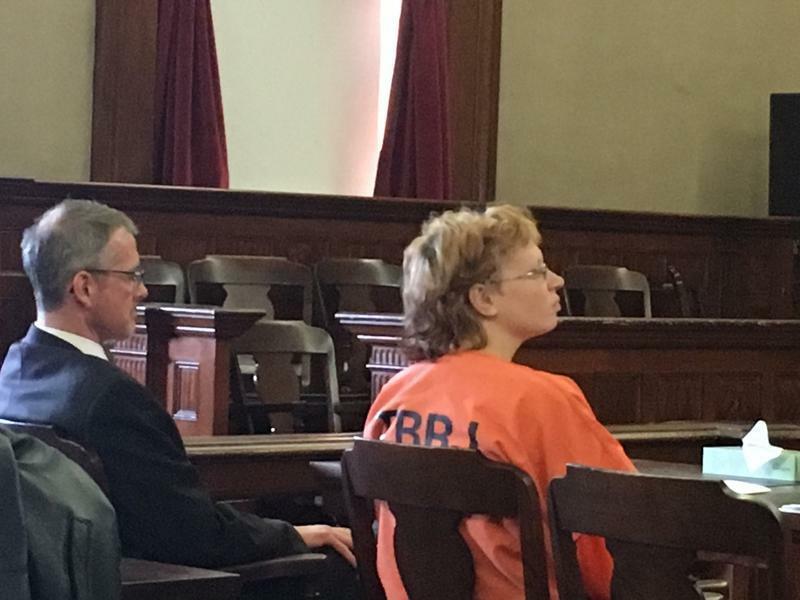 Sharon Carrillo in court in March 28, 2018 with one of her attorneys, Chris MacLean. It was in mid-March when state prosecutors sent a subpoena to a school Sharon Carrillo previously attended in New York. The subpoena ordered the school CEO to appear in court in Maine April 6 and produce Carrillo's school records, or the alternative, to send the records by email. The CEO chose the latter, and state prosecutors received 73 pages of confidential information. But those records were obtained improperly, says Carrillo's defense attorney Chris MacLean - because there was, in fact, no court date set for April 6. "We all make mistakes. It's a mistake when we put the wrong date on a subpoena," MacLean said. "It's not a mistake when we put a fictitious court date on a subpoena and we instruct a witness to appear in a court in the state of Maine on a fictitious court date." MacLean told the Maine Supreme Judicial Court that state prosecutors also sent the subpoena across state lines without prior approval, and failed to instruct the school to send confidential records directly to a judge. A lower court agreed that the state made errors, and ordered Carrillo's confidential records to be placed under seal. But MacLean also wants the two state prosecutors on the case to be disqualified. "I'm representing a young woman who's shaken to the core by the violation of her rights," he said. "I'm representing a young woman who has the mentality of a 12-year-old child. "So, Mr. MacLean, I'm going to stop you right there," said Chief Justice Leigh Saufley. Saufley pointed out at Tuesday's hearing that MacLean has already told news outlets that 33-year old Carrillo has cognitive challenges. That's also what the state learned from the subpoenaed records. Given that it's information that's already known, Saufley asked, "What is it that is lost since everyone appears to understand that there are challenges your client faces?" According to Assistant Attorney General Leanne Robbin, nothing. She told the justices that MacLean failed to show how Carrillo would be harmed by prosecutors staying on the case. "To encourage a pretrial motion to disqualify prosecutors when they are in error of some sort would be a terrible precedent," Robbin said. Robbin also said the mistakes the state made when it issued the subpoena were not intentional, which drew this question from Justice Saufley: "How can a fictitiously established court date, which is part of the threat if you fail to send the records, be something that is purely a mistake? That looks like intentional action." Robbin chalked it up to procedural errors, and said the attorney general's office is taking action to prevent similar problems in the future. Now, Maine's Supreme Court justices will decide whether it's appropriate to also disqualify from the case the state prosecutors involved.